The Eagle Ford Shale rig count decreased by six to 261 rigs running over the past week. In recent news, EOG Resources joint venture with ZaZa Energy moves into its third and final phase in the Eaglebine. ZaZa will receive $15 million and an additional two-well drilling commitment from EOG. As part of the agreement, EOG must begin drilling the first of two wells by July 1, 2014. In exchange, EOG will gain a 75% working interest in all of Zaza's remaining acreage. The U.S. rig count decreased by six to 1803 rigs running over the past week. A total of 326 rigs are targeting natural gas (18 less than last week) and 1,473 are targeting oil in the U.S. (12 more than last week). The remainder are drilling service wells (e.g. disposal wells, injection wells, etc.). 858or ~48% of rigs active in the U.S. are running in Texas. Baker Hughes rig count is quoted here. Baker Hughes also releases its own Eagle Ford Rig Count that covers the 14 core counties (219 rigs). 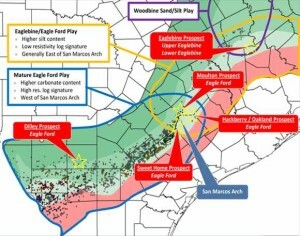 The rig count published on EagleFordShale.com includes a 30 county area impacted by Eagle Ford development. A full list of the counties included can be found in the table near the bottom of this article. The natural gas rig count decreased by 14 to 24 rigs running this past week. Average rig counts for natural gas production in 2012 were around 82 and then dropped to around 41 in 2013. Over the past week, natural gas decreased slightly to $4.31/mmbtu on Friday afternoon. The oil rig count increased by eight to 237 rigs running. WTI oil prices decreased, trading at $99.56/bbl by the end of the week. Eagle Ford light crude traded at $96.00/bbl on March 21st.